Sometimes, I wonder what the first settlers of what’s now Gainesville, Florida, thought when they stumbled across Devil’s Millhopper. I imagine they were strolling through the woods, minding their own business when suddenly – bam! The nice, flat land gave way to this gaping maw in the ground stretching 500 feet across and 120 feet deep. It must have been startling. One minute there was serene woods and the next a giant hole leading into the netherworld. The setting for Devil’s Millhopper is beautiful and lush. There are ferns, pine trees, needle palms, and oaks. There’s the constant sound of birds chirping and the echo of water flowing from the rim to the bottom of the sink. And in the midst of all this peaceful beauty, there’s this feeling that you’ve stepped into something otherworldly. The Florida peninsula, with its limestone bedrock, is particularly susceptible to sinkhole formation. Under normal conditions, it’s a slow process. Over time, rainwater creates cracks and fissures in the limestone and the resulting instability eventually causes the surface collapse forming a sinkhole. 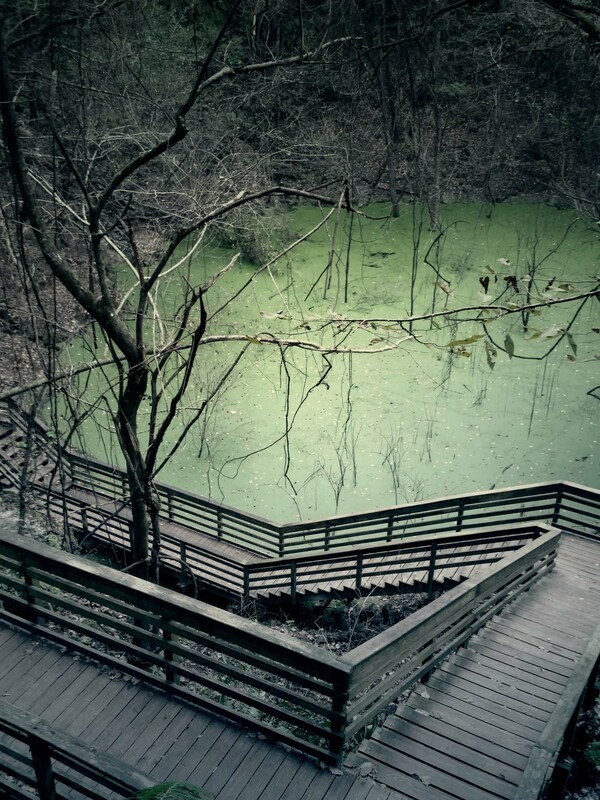 Despite the name, there really isn’t anything scary about Devil’s Millhopper, and visitors have enjoyed the National Natural Landmark since the late 1800s. In the 1930s, it was chosen as a site for a Civilian Conservation Corps (CCC) trail creation project. Unlike Shenandoah, where you can see the remnants of the CCC’s work nearly everywhere you turn, the trail they built didn’t last. The railroad tie steps, which once descended from the rim to the bottom, contributed to the sinkhole’s erosion. Today, the remnants of the steps are buried under dense flora. By the time my parents arrived in Gainesville from Miami in the late 1960s/early 1970s, Devil’s Millhopper was a mess. Even though I’ve heard the story before, I used our adventure as an excuse to ask my mom about her first visit back in 1972. She remembers it being kind of scary. She can’t recall exactly how they got down to the sink, and she thinks they just picked their way down the steep sides until they reached the bottom. Oy. She remembers that other students would sometimes slide down the sides on homemade sleds and hold parties at the sink. This is one of those strange things that I’ve heard other people who lived in Gainesville in the 60s and 70s. I always thought it was a weird local urban legend. There are trees and sticks and rocks and snakes all the way down – how on earth could anyone slide to the bottom without suffering a major injury? So it looks like it’s true! I’m sorry I doubted you, Mom. The parties and bad behavior at the sinkhole ended in 1974 when the Florida Division of Recreation and Parks took over Devil’s Millhopper from the University of Florida and designated it a state park. 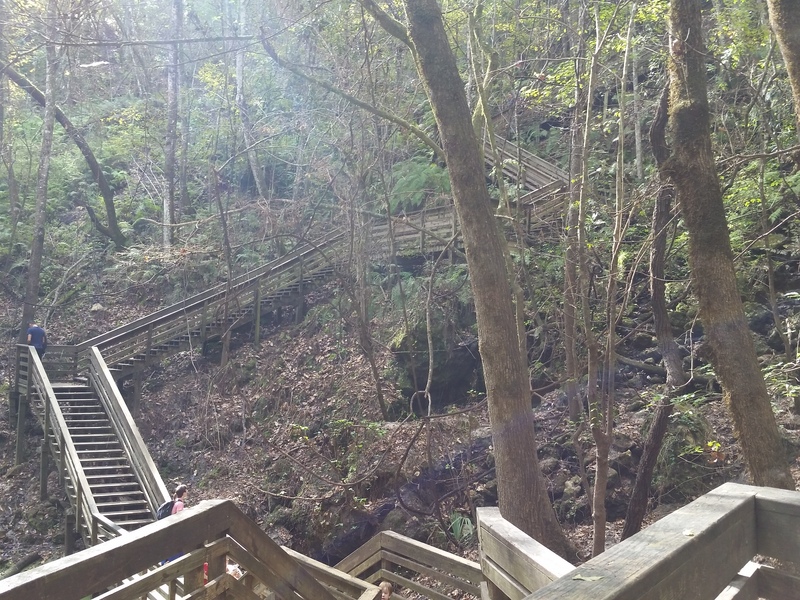 They cleaned the area up and built the 232 elevated stairs and viewing platform that allow visitors to enjoy Devil’s Millhopper without destroying it. By all accounts, they saved the sinkhole and made it possible for younger Gainesvillians, like me, to grow up enjoying it. I was raised less than a mile from Devil’s Millhopper, and it’s always been a part of my life. I drove past it at minimum two times a day every day, I visited it with my family, and I toured it on school field trips. My brother, Mike, even chose it as the site for his Eagle Scout project. 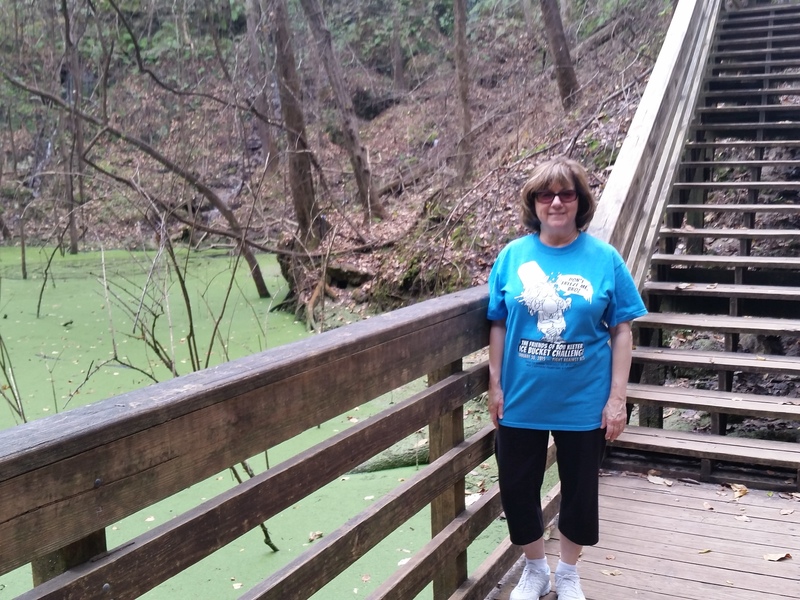 My mom had talked about visiting Devil’s Millhopper since before I even arrived in Gainesville for my visit. A few weeks prior, she’d done the steps with some cousins visiting from Baltimore and found the sink so full from recent rainfall that the entire bottom viewing platform was closed to the public. Here’s why that’s exceptional: the bottom of the sinkhole is like the drain at the bottom of a sink — ultimately channeling the water that enters it into the Florida aquifer. Without the opening, water would get trapped at the bottom, the sinkhole would fill up, and it would become a really, really deep lake. In my years visiting Devil’s Millhopper, I’ve seen the sink with water in it, I’ve seen the sink completely dry, but I’ve never seen the sink so full that the water level has reached the viewing platform. I had to see it for myself. Normally, even when there’s water in the sink, you can’t see it from the rim. Sometimes you have to get all the way to the bottom viewing platform before you can see any water at all. Not on this trip. As we leaned over the fence surrounding the rim, the bright green water at the bottom was impossible to miss. The park was pretty empty with only a few other families walking up and down the steps. A few of the families were clearly showing the sinkhole off to relatives visiting from out of town (a time-honored Gainesville tradition). Others were doing circuits up and down for exercise. One family even had a little boy with them who they were letting climb down at his own pace. 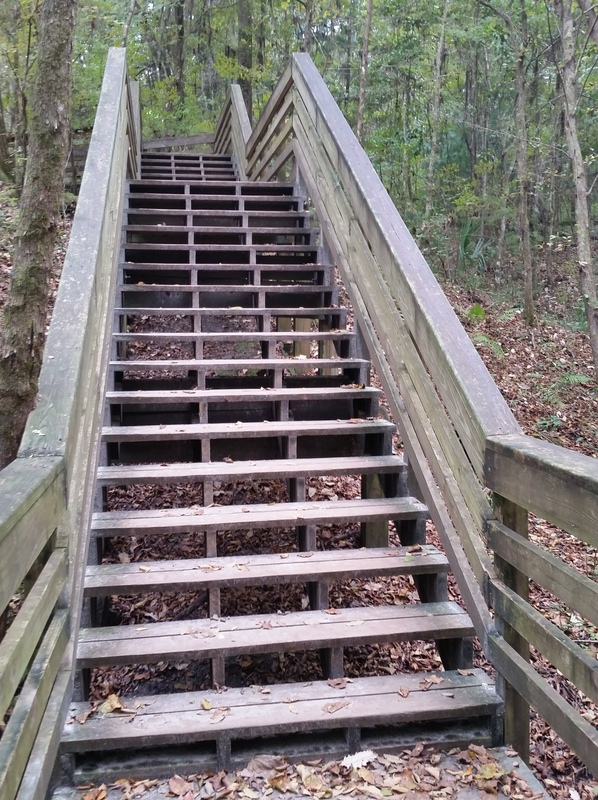 It was cute and brought back good memories of doing the steps as a little kid. I can remember it taking forever to go up and down the stairs on my pint-sized legs. But now that I have the full-sized legs of a moderately short adult, it actually doesn’t take very long to get to the viewing platform at the bottom. Honestly, if my mom and I hadn’t stopped to marvel at the plant life, snap pictures, and chat at the different viewing platforms, we probably would have reached the bottom in well under 10 minutes. The water level was high, not as high as it was for my Baltimore relatives, but much higher than I’ve ever seen it, coming just below the viewing platform. Thankfully, it was low enough that the viewing platform was reopened for our visit. As we reached the bottom, we were surrounded by the sound of water flowing down the sides. We counted eight waterfalls – not a typical site in flat Florida! We stayed at the bottom for a while, enjoying the nice weather, taking in the views, chatting with other visitors, and gearing ourselves up for the hardest part of our visit – climbing out of the sink. Going up the steps is less of a challenge for me now since climbing up and down mountains and giant hills has become a pretty regular part of my life. In my days living in Florida, something like this was a huge struggle. I’ve mentioned this a lot already, but I can’t emphasize it enough, Florida is really, really flat. I didn’t earn my hill climbing muscles until I was an adult. There are also (and I have no proof for this claim, I’ve just noticed it through observation) fewer stairs and much better elevator access in the sunshine state. Full disclosure: this was probably the first time I’ve climbed the 232 steps without wanting to die a little afterward. We were only in the sinkhole for about 40 minutes, which seemed too short to end our outing. Since we weren’t quite ready to leave yet, we decided to walk the half mile trail around the rim. My family has kind of a soft spot for this part of the park since it’s one of the areas directly impacted by my brother’s Eagle Scout project. 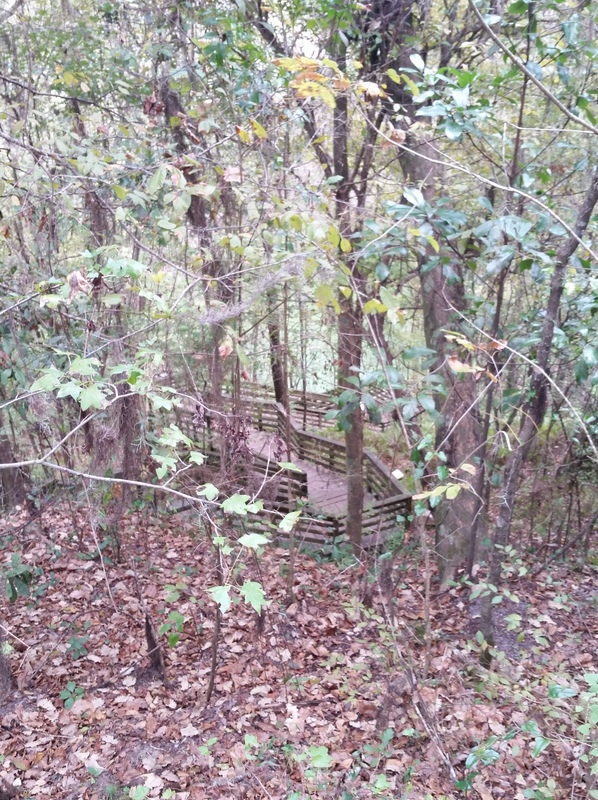 Mike’s project had two parts – he planted saplings in the park’s forest and he built benches for the trail. I can still remember being 10 years old and walking around the park with my mom while my brothers, my dad, and the scout troop worked on Mike’s project. I always loved the sinkhole, and I remember feeling so good that everyone was coming together to do something special for this place. I’m sure it makes Mike happy to think about how many visitors have enjoyed the benches over the years. 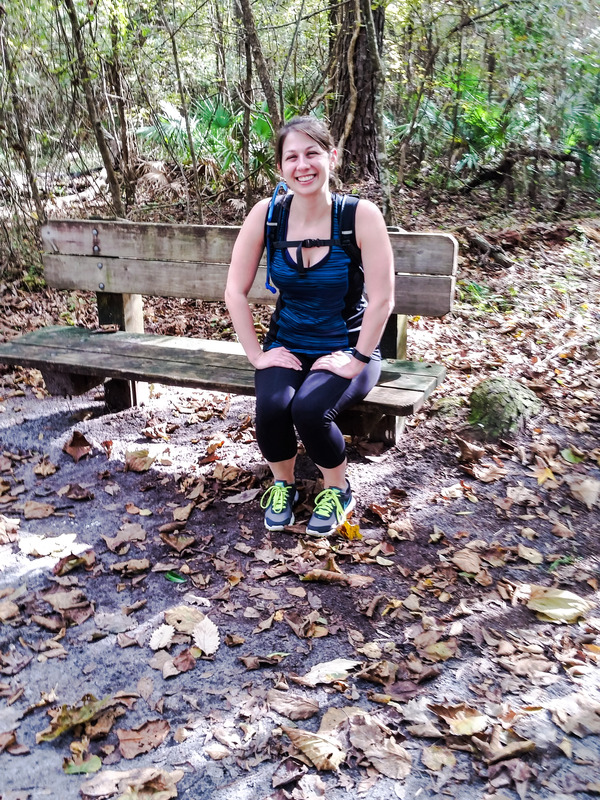 Now, almost 20 years later, there are still benches on the trail. We aren’t sure if they’re the same ones built for Mike’s project, but they look the same as I remembered from the last time I visited. The rim trail is short, flat, and really easy. It gave my mom and me an opportunity to cool down from the exertion of climbing up and down the sinkhole’s stairs and took us approximately 10 minutes to walk. 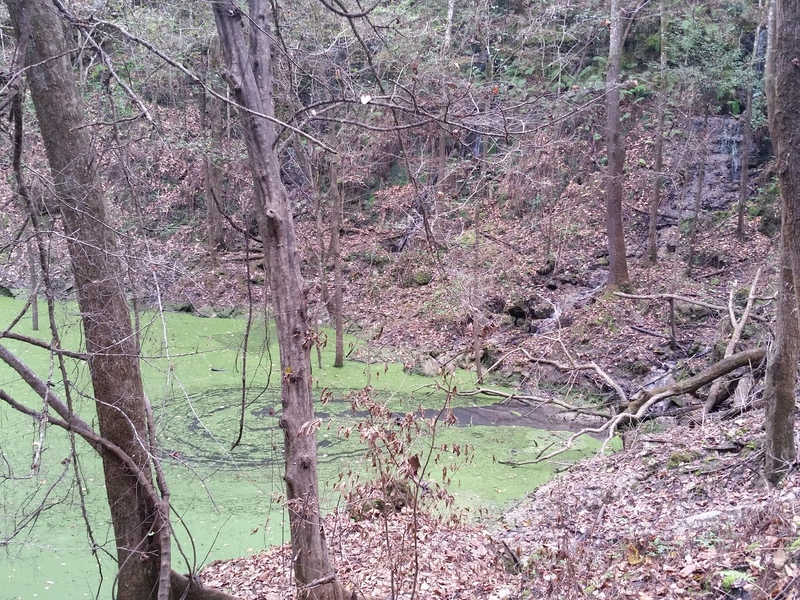 Devil’s Millhopper is a small park – only 71 acres. It may not be an epic adventure, but it is one of the region’s most breathtaking natural wonders. 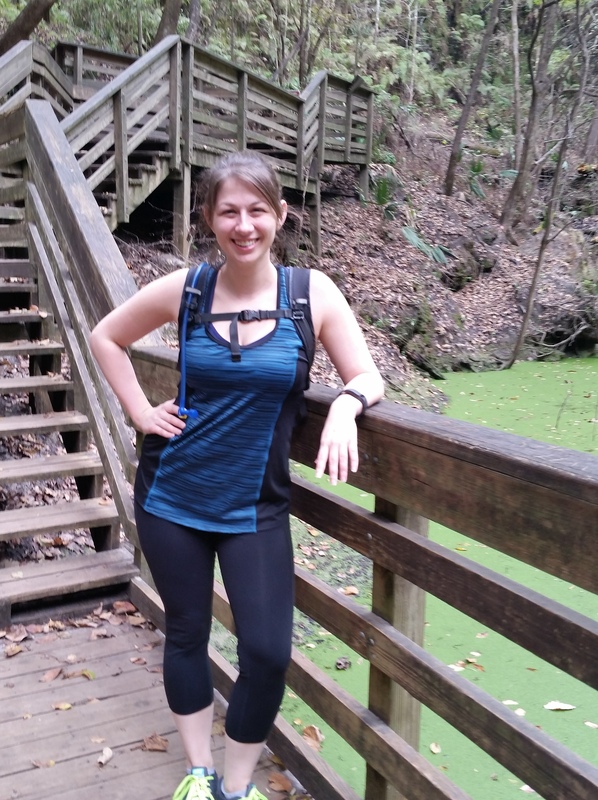 If you’re planning on making a visit to Gainesville, I strongly recommend adding Devil’s Millhopper to your activity list. Never doubt mom! LOL Great write-up. Right? Lesson learned, I’m never doubting her again. I’m putting this one on my list! Have you been to Devil’s Den? I’ve visited all kinds of off-the-beaten-path spots in Florida, but somehow I’ve never made it to Devil’s Den (unless I went as a kid and just can’t remember). It’s a huge shame since Williston is so close to Gainesville. Have you been? If yes, I’d love to see links to pics/your content. I haven’t yet but it’s in my list. Looks amazing! !